Cold walls, drafts inside your home, and high energy bills are all signs you are in need of new or better insulation in your exterior walls. The comfort inside your home should be first priority, as that is where you tend to spend the majority of your life and is one of your biggest investments. RELATED: How Much Does Foam Insulation Cost for an Existing Home? RetroFoam of Michigan has insulated the walls of thousands of homes across the state over the past 15 years, and our team knows that insulating the walls in your existing home with injection foam can remedy the issues you’re having without tearing down drywall or making a huge mess. What Determines the Cost of Foam Insulation for Walls? Typically when someone has their existing walls insulated, they do all of the exterior walls. The cost for doing all four of the exterior walls will range anywhere from $3,000 to $7,000. The size of the treated area to be injected with foam insulation is the largest contributing factor to the cost of the project. The bigger the area to be insulated, the more expensive the job will be. What Variables Determine the Cost to Insulate Existing Walls? Just like any insulation job, the size of the surface area is the biggest determining factor in price for insulating existing walls. If a home is more than one story, then there can be additional costs due to the difficulty of the job. When insulating the exterior walls, crews generally work from the outside, so the type of siding on the house can also be a factor in the total cost. While vinyl siding tends to be the easiest to work with, aluminum is slightly more difficult and brick and wood are the hardest. What are Some Indications the Walls Need Insulation? Feeling drafts come in from outlets and light switch covers. Walls are cold to the touch. The dishes in exterior wall cabinets are cold. What is the Difference Between Vinyl, Aluminum, Brick and Wood Siding When Insulating Existing Walls? The type of siding you have can change the installation process slightly for re-insulating existing walls. Vinyl siding is the easiest to work with when insulating walls because it has a hook and loop system making it easier to remove and replace. It is also a polymer material, meaning it is pliable and won’t bend or crack. Aluminum siding tends to be more difficult to work with because it isn’t pliable. When the siding bends, it must be bent back into shape, which could leave dimples and dents in it. The way aluminum siding is attached to the home makes it more difficult to work with as well. Aluminum is nailed or fastened to the exterior of the home, so crews have to unfasten the siding before the job and replace the nails when the job is finished, making it more difficult to take on and off. Working with Brick siding tends to take more time, because crews must drill into the mortar to reach the wall cavity. While one person drills, another person follows behind them to clean-up the dust and mortar. A good contractor will make and match the mortar of the home on site to ensure it matches. A third crew member will follow along behind the person injecting the foam that works to fill in the holes drilled with mortar. The best contractors don’t just patch the outside of the brick and mortar, but instead inject the drilled holes with mortar, filling the entire space and then smoothing the area over. Wood siding is worked with completely differently than other types of siding. Many times crews drill into the face of the wood from the outside. A chalk line is used to drill uniform 2 ½ inch holes through the siding to inject foam into the existing wall cavity. After the foreman injects foam, another crew member follows behind them plugging the holes with a wooden plug. Good contractors will use a real pine faced plug that is tapered so it is snug, but not tight enough to crack the wood. 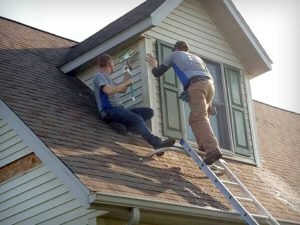 Once the plugs are placed, the homeowner can easily paint over them to match the siding. Can the Installation Be Done from Inside the Home? If the homeowner has an exterior of their home they would prefer not to have drilled into, then crews can work from inside the home. Crews can also work inside to insulate a common wall between the house and the garage. The process is similar as crews measure out where to drill the 2 ½ inch holes in the middle of the cavity. There is also different prep work on the contractor’s part when working inside the home. Crews lay down plastic and will have a vacuum system to clean up the dust created during the job. Once the foam has been injected into the wall cavities, crews fill the holes with a Styrofoam plug and place mesh tape over it to hold it in place. A rough coat of mud is then spread over the area for the homeowner. There will be additional sanding and finishing required of the customer. After an estimator has come to your home and you agree to the work, the real fun begins. When doing exterior existing walls there isn’t any cleanup that needs to take place before the install. Crews will ask the homeowner to take down any pictures and knickknacks because the vibrations from the drilling could knock them down. Homeowners are also asked to clear as much of the landscaping as possible away from the area where crews will be working. An experienced contractor knows many elements of landscaping can’t be moved and will work around them. As the job begins, crews start at a corner and about 4 feet up the cavity where they drill the first hole next to the stud. A slim jim is used to measure the space between studs where another hole is drilled. This is done to ensure every cavity is filled with injection foam. Once the holes are drilled, the foreman begins injecting the foam into the cavities. Behind the foreman, someone cleans up the excess foam and fills the drilled hole with a Styrofoam plug. A crew follows behind that person mopping up the siding, cleaning up foam and wood shavings on the ground, and replacing the siding. From start to finish it’s much like an assembly line where everyone has a job to keep the project moving quickly. 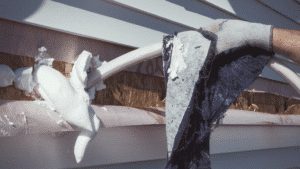 How Long Does It Take to Inject Foam into Exterior Existing Walls? An average exterior walls job will usually take anywhere from 3 to 5 hours. That may seem fast, but with nearly 15 years experience RetroFoam of Michigan crews are a fine tuned machine that keeps every person moving. What Services are Included When Insulating Existing Walls? What are the Benefits of Insulating Existing Walls? Some of the benefits of insulating or reinsulating your existing walls are lower energy bills, cutting down on drafts from outlets, and in some cases customers have reported a reduction in outside noise. Sometimes cold air moving through the walls can contribute to the discomfort you are feeling in your home, but sometimes there is more to the discomfort you are feeling. An experienced contractor won’t hit you with additional hidden fees once the job is complete. The estimate you sign and agree to before the job begins should be the final cost of the project. When you are ready to schedule a free in-home estimate give us a call at 866-900-3626, or fill out the form requesting an estimate. You can also check out our budget calculator to give you a rough idea of the cost of the project on our website.